Welcome all you Angelina Ballerina Fans! Last weekend my daughter had her fifth birthday party. I cant believe my Baby Girl is five now. My outlook has to change about her because as my Aunt informed me, "Five is a big girl! Not a baby. Melanie (my cousin) has a baby. She wears diapers." So I may have to give up the title for "Baby" Girl... my Aunt does have a point... hehe. Anyways. The party was a blast and Trinity loved every minute of it. The cake I made for her as Angelina Ballerina. This was her theme she wanted as she is extremely into all things ballet at the moment. The next photo here is of me and her and thanks to Miley Cirus' line of clothes at walmart I was able to create a Ballet Grand Dame. I know that seems crazy but the low waisted tutu attached to a tank top with a pair of black leggings underneath was just what I needed to go under this gray top I had. I thought the girls a little ballet dance to a rhyme and we made dancing ribbons as a craft. This other photo is Trinity being stubborn with her toes where my DH and her were posing he was trying to get her to point her toes and be as graceful as a ballerina... NA she was in a playful mood and would not comply. He is the one that took the pic at the top of this post and did a great job helping me with the party and all the set up. 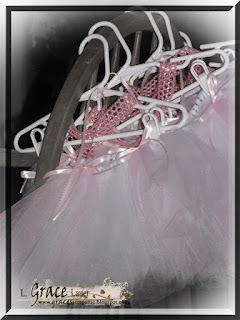 These are the tutus I made for all the girls... seven of them to be exact. I was able to create these with a no sew pattern and embellish them with some ribbons. 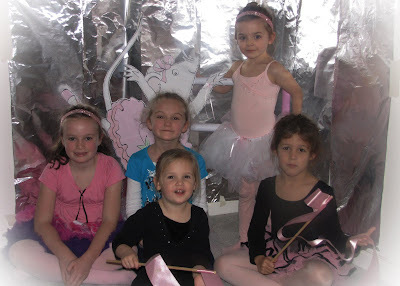 This is a picture of the Angelina Ballerina New Ballet Party Class. They had a wonderful time and it truly was a memorable event. Don't they look great! The life size Angelina Ballerina was made by me and the hubby. I hope you all enjoyed these. I had a blast making the tutus and the dancing ribbons... but that cake. That was HARD... LOL. Glad you took the time to peek into the craziness that is my mind when it comes to my kid's parties. What can I say. It is the memories that last a lifetime that drives me to be like this. 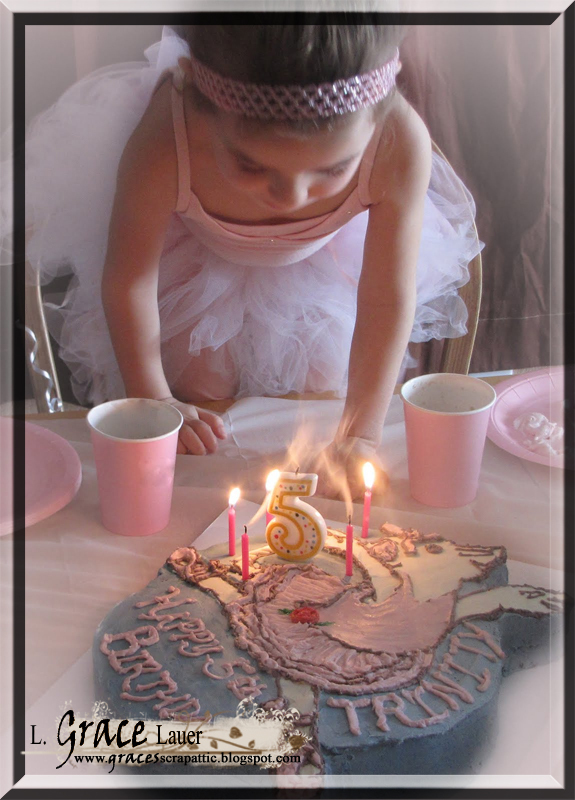 Check my post with our 3D Tutu Angelina Ballerina Birthday Invitations. They were so much fun to make and I just love how well they turned out.